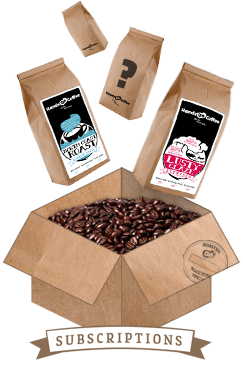 Fancy a regular supply of freshly micro-roasted coffee delivered to your door every month? With our 6-month or 1-year subscriptions you can choose either 250g per month, or for the serious coffee connoisseur a 500g bag of coffee per month. If you like variety, this is the option to go for! It makes a great gift too. How it works: Our roaster will personally pick your coffee from our selection, keeping things interesting and seasonal by selecting what’s in the roastery at the time. It’ll then be roasted and bagged by hand, and posted by Royal Mail. We offer a ‘green bean’ option for home-roasters too. Please choose whether you would like your coffee posted at the beginning or middle of the month in the drop-down box (by selecting 1st or 15th ). We’ll then roast and post each month as near to this date as possible. If you’re taking the subscription as a gift, just leave a note in the box at checkout or send us an email so we know what postal address to use.